As the designated Audubon North Carolina chapter for the High Country, the High Country Audubon Society (HCAS) takes its role of fostering the development of new birders, young and old alike, very seriously. HCAS utilizes your contributions to fund multiple projects designed to engage and develop birding in our five-county region. HCAS sponsors the HCAS Birding Scholarship and the Sue Wells Research Grant, both of which are directed at young birders. HCAS also loans binoculars and birding guides to new birders on bird walks and at festivals in the area. 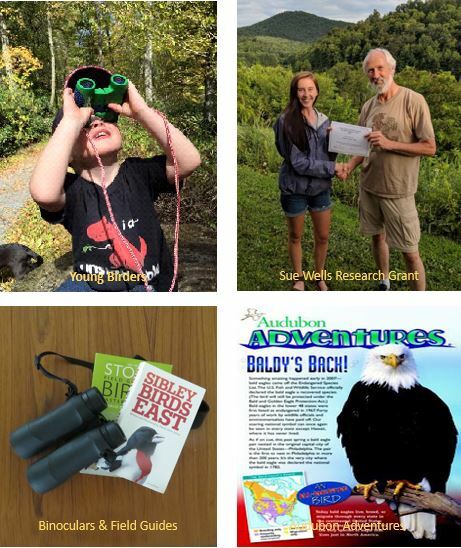 Finally, HCAS participates in the numerous National Audubon Society programs which are focused on educating the next generations about the fun and importance of birding.